SAN FRANCISCO, Calif.--(BUSINESS WIRE)--The CMMI Institute today announces the CMMI Cybermaturity Platform, a comprehensive enterprise cybersecurity capability and risk assessment platform that provides cybersecurity and senior executives with the evidence and insights to improve cybersecurity resilience. The cloud-based platform, an ISACA Cyber Solution, was developed through research and testing with hundreds of CISOs, CIOs, and CSOs in the last year. The platform features custom risk profiling, assessment, gap analyses, and roadmap functions, and is in use across multiple sectors including financial services, healthcare, and manufacturing. ISACA’s just-released 2018 State of Cybersecurity Part 1, in which nearly 1 in 3 (31 percent) security professionals says their board hasn’t adequately prioritized security. Increased board and c-suite confidence, driven by pragmatic, insightful, easy-to-understand reports, aligned to business objectives. As the only cloud-hosted cybersecurity maturity management application, the CMMI Cybermaturity Platform gives businesses real-time knowledge of best cybersecurity practices, so organizations can make evidence-based decisions on how to improve cybersecurity programs. The platform enables business and technology leaders to assess and view all facets of their cybersecurity program and capabilities through a risk lens to better develop a cohesive cyber strategy. 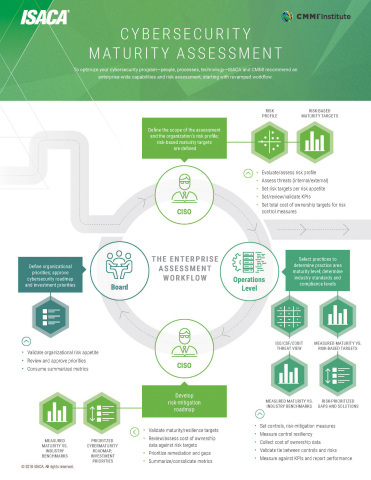 The CMMI Cybermaturity Platform’s assessment generates a unique risk profile, prioritizes the gaps in capabilities, identifies the maturity required to achieve organizational goals, and recommends options to address the gaps. The program defines maturity for people, process and technology and will enable industry benchmarking. The CMMI Cybermaturity Platform establishes a framework of best cyber practices which aligns with the leading industry standards, such as NIST CSF, COBIT, ISO, Cloud Security Alliance and dozens more. Further information on the assessment approach and organizational roadmaps to cyber resiliency can be found at cmmiinstitute.com/cybermaturity. Nearing its 50th year, ISACA® (isaca.org) is a global association helping individuals and enterprises achieve the positive potential of technology. Today’s world is powered by technology, and ISACA equips professionals with the knowledge, credentials, education and community to advance their careers and transform their organizations. ISACA leverages the expertise of its 450,000 engaged professionals in information and cybersecurity, governance, assurance, risk and innovation, as well as its enterprise performance subsidiary, CMMI® Institute, to help advance innovation through technology. ISACA has a presence in more than 188 countries, including more than 215 chapters worldwide and offices in both the United States and China. CMMI Institute has launched the CMMI Cybermaturity Platform, a comprehensive enterprise cybersecurity capability and risk assessment platform.